In announcing the failure of the Republican health care plan, President Donald Trump said, “The best thing we can do politically speaking is let Obamacare explode.” Later, he threatened to destabilize coverage for millions of people to force Democrats to support a revived legislative effort to take coverage away from millions more. These intemperate statements are not only out of touch with the views of the American people, but they also have real consequences for people’s coverage. By creating uncertainty as to whether the administration will promote a functioning insurance market or use every tool at its disposal to undermine it, Trump is increasing premiums for millions of Americans. Many experts have already warned that if Trump refuses to enforce the Affordable Care Act’s, or ACA’s, individual mandate or fund subsidies for low-income enrollees, consumers will see premiums skyrocket. But even without taking direct action, the Trump administration is still pushing insurers to raise premiums. Trump’s rhetoric creates a climate of uncertainty for health insurers that puts upward pressure on rates and discourages them from future participation in the exchanges. We expect this generalized market uncertainty will itself raise premiums for 2018. If insurers raise rates by an additional 8.5 to 17 percent to account for a 25 to 50 percent risk that the Administration will undermine ACA subsidies and mandate enforcement, the average annual premium would rise by an extra $480 to $960 in 2018. While ACA subsidies will protect most enrollees from these uncertainty rate hikes, millions will see their premiums rise and taxpayers will foot the bill for increased subsidy costs. The administration has already taken steps that will hurt the market and increase premiums, including halting outreach efforts at the end of the 2017 open enrollment period and drastically shortening the enrollment period for next year. The administration can prevent even larger premium hikes, but, given the widespread uncertainty that the president and congressional Republicans have already created, they need to act now. Trump and Congress must take concrete steps in the coming weeks to make clear that subsidy payments will be made on a permanent basis, that the individual mandate will be fully enforced, that the administration will conduct similar outreach and operational efforts as in past years to drive enrollment, and that they will stop their damaging efforts to repeal the ACA. Insurers are currently setting prices for 2018, with proposed rates coming in the next month or two and final rates by late summer or early fall. During this process, insurers typically consider a range of factors, including the anticipated number of enrollees, their expected health expenditures for the year, and trends in medical costs. Government actuaries predicted that costs in the individual market would grow by 7.2 percent for 2018. If the market is in equilibrium—and it is likely that insurers will be profitable or close to it this year—then premiums should not increase by more than this medical trend. But now insurers must also account for possible cost increases resulting from legislative changes or executive actions by the Trump administration. The higher the risk of such changes, the greater the pressure on insurers to hike rates beyond what they would charge based on normal market factors—what S&P has called an “uncertainty buffer.” While there are a range of factors contributing to uncertainty, the primary drivers for insurers are whether the administration will make required subsidy payments, known as cost-sharing reductions, and whether it will adequately enforce the individual mandate. Trump is already attempting to use millions of Americans’ health insurance as a bargaining chip for his own political gain. In an effort to force Democrats to negotiate with him on repealing the ACA, Trump threatened to hold hostage subsidies for low-income enrollees. Under the ACA, enrollees with income between 100 to 250 percent of the federal poverty level can enroll in plans with lower deductibles, coinsurance, and copayments. The administration is required to reimburse insurers for reducing out-of-pocket costs for low-income enrollees enrolled in such plans. In 2017, more than 7 million enrollees will receive these subsidies, worth a total of $7 billion. According to a recent Kaiser Family Foundation report, these payments reduce enrollees’ medical and prescription drug deductibles by up to $3,354 and reduce annual out-of-pocket maximums by up to $5,587 in 2017. In an effort to undermine the ACA, House Republicans sued the Obama administration in 2014 to stop cost-sharing reduction payments, arguing that Congress had not provided funds for them. A District Court ruled in favor of the House, and the case is currently on appeal before the D.C. Circuit. After the change in administration, however, both sides asked the court for additional time to allow “for a resolution that would obviate the need for judicial determination of this appeal, including potential legislative action.” The House has said that the subsidies will be provided while the litigation continues. The Trump administration, however, could stop the payments at any time or halt its appeal of the lower court decision, either of which would cease the cost-sharing reduction payments immediately. Even in a face-to-face meeting with insurance company executives, administration officials refused to indicate whether the subsidies would be funded. Regardless of whether the administration provides the required funding, insurers must offer options with lower out-of-pocket costs to eligible consumers. If the administration fails to pay cost-sharing reductions directly, insurers will be forced to increase premiums to cover their costs or to leave the exchanges entirely. As the CEO of Molina Healthcare warned, “We might drop out of the marketplace if the cost sharing reductions go away this year. Getting that issue resolved is really important.” Even prominent conservative health policy experts and the U.S. Chamber of Commerce have encouraged Congress to pay the cost-sharing reductions for 2018 for the sake of market stability. And asking for another extension in the lawsuit would only heighten the concern, since insurers would then have to set their rates without knowing how the administration and Congress plan to resolve the case. 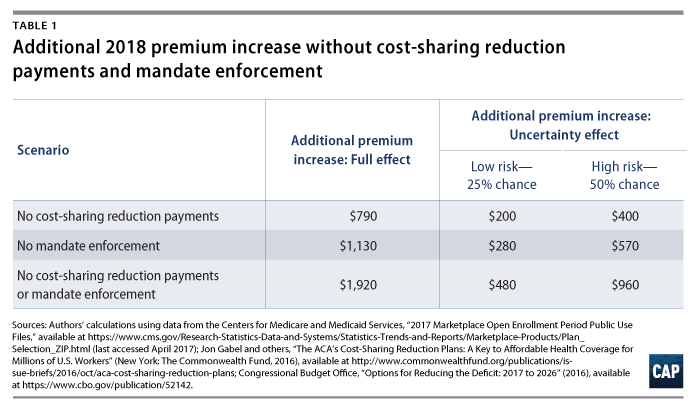 A study by The Commonwealth Fund suggests that eliminating cost-sharing reductions payments could increase premiums by 14 percent, in addition to causing a large number of insurers to leave the exchanges. Other studies have suggested an even higher increase if the compensating premium increase occurs among silver plans alone, from 19 to 29 percent. Similar estimates have been put forward by insurers, actuaries, and insurance commissioners, as well as by hospitals, doctors, and the U.S. Chamber of Commerce. To remove this uncertainty, President Trump and Congress must make clear that they will not play political games with people’s lives, that they will fulfill their obligations under the ACA, and they will fully fund cost-sharing reduction payments on a permanent basis. Congressional Republicans have repeatedly sought to repeal the individual mandate, including in their replacement plan for the ACA, despite the fact that doing so would lessen the number of healthy individuals in the risk pool and cause premiums to rise. At the same time, President Trump has already taken steps to undermine the effectiveness of the mandate by issuing an executive order that raises questions about whether he will robustly enforce it. The ACA’s individual shared responsibility provision requires individuals who fail to obtain health insurance to pay a penalty adjusted for income. The penalty limits adverse selection by preventing people from obtaining coverage only when they need health care and helps ensure a sufficient number of healthy enrollees. Trump’s potential disregard for the law is no idle concern. As one of his first acts as president, he signed an executive order that, among other actions, directs administration officials to “waive, defer, [or] grant exemptions from” the individual mandate. As a result of this order, the Internal Revenue Service reversed its decision to reject so-called silent returns, in which a tax filer does not indicate whether they had qualified health coverage and is therefore subject to the mandate penalty, a policy it had previously proposed to improve compliance with the individual mandate. Complete repeal of the individual mandate would raise premiums by 20 percent, according to estimates from the Congressional Budget Office. While formal repeal would require congressional action, Trump could continue to direct administrative changes to enforcement of the mandate to render it partially or fully ineffective. Insurers are rightly concerned that insufficient enforcement of the individual mandate could shrink and skew the risk pool. In order to remove this uncertainty and avoid driving up premiums, President Trump should rescind his executive order and must make clear that his Administration will continue to fully enforce the individual mandate. But even the mere possibility that the Administration fails to implement these ACA provisions could spur a rate hike. Assuming a 25 percent chance that both these changes occur would suggest an 8.5 percent rate hike, or $480 annually on top of normal premium growth, as shown in Table 1. If insurers priced in a 50 percent likelihood of both these changes, that would lead to 17 percent increase or $960. Note that heightened unpredictability also makes insurers more likely to simply leave the market entirely—especially if the administration’s statements and actions to date lead them to conclude that it will try to sabotage the market. 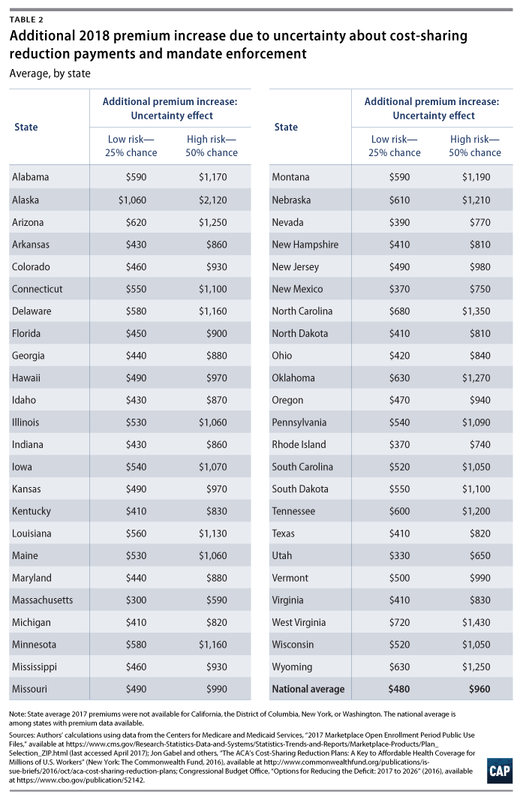 The size of the uncertainty rate hike would vary by state, as shown in Table 2. If we assume an uncertainty rate hike of 8.5 percent above the normal increase, equivalent to insurers hedging against a 25 percent chance of loss of the mandate and cost-sharing reductions, the extra annual premium increase would range from $300 on average in Massachusetts to an average of $1,060 in Alaska. If insurers build in a 50 percent chance the administration takes both these major actions to undermine the exchanges, the average rate hike would be more than $1,000 in close to half the states. An important determinant for sustainability of the exchanges are outreach and enrollment activities, and in past years the U.S. Department of Health and Human Services led these efforts. Reducing consumer engagement depresses enrollment and weakens the health of the insurance risk pool. Trump has already scaled back outreach and enrollment efforts. Shortly after he was inaugurated, Trump halted millions of dollars’ worth of already-paid-for advertising to remind consumers of the deadline for health insurance enrollment. The former chief marketing officer for HealthCare.gov estimated that eliminating this advertising during the crucial final days of the open enrollment period reduced enrollment by 480,000 people. 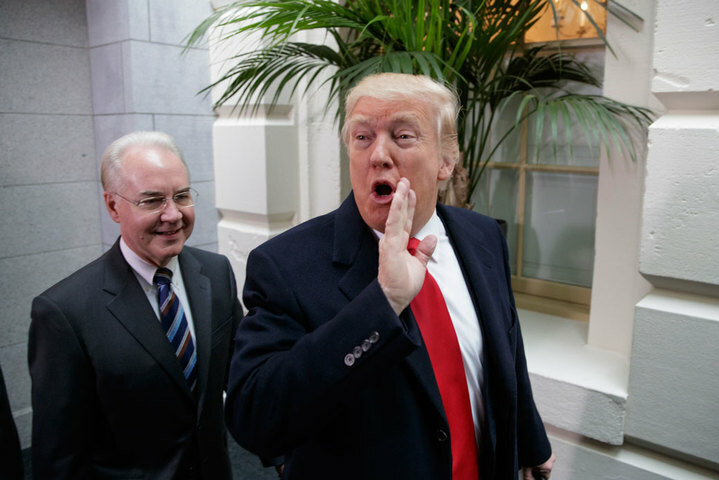 The Trump administration’s other changes to outreach messaging, including removing a reference to the individual mandate, likely decreased the number of younger and healthier enrollees. The administration also cut the upcoming open enrollment period in half, a move it acknowledges “could lead to a reduction in enrollees, primarily younger and healthier enrollees who usually enroll late in the enrollment period.” Given the importance of a sufficiently large pool of enrollees, and particularly younger and healthier enrollees, to ensuring a stable market, neglecting outreach and enrollment activities in advance of the 2018 plan year could have significant negative effects on the risk pool, and thus increase premiums. Prolonging discussions about repeal of the ACA also negatively affect the individual market. While the House failed to vote on the most recent Republican proposal, which would have caused 24 million Americans to lose their coverage and increased premiums for equivalent coverage by 13 percent by 2026, negotiations about the bill continue. Given that all the Republican proposals to date would dramatically reduce the number of people in the individual market, eliminate the subsidy structure that makes coverage affordable, and even potentially allow for insurers to charge exorbitant rates for preexisting conditions, the adoption of any of these proposals would result in higher health care costs for consumers. Until the Trump administration and congressional Republican make clear they will not repeal the ACA, insurers will likely hedge against possible legislative action when setting 2018 rates. As one former government health official noted: “many insurers are likely to submit proposed rates that are calibrated based on the 15 to 20 percent higher-cost risk pool they would face if the AHCA were enacted.” Ending the failing efforts to repeal the ACA, in which Republican proposals keep getting worse by the day, would go a long way to reducing uncertainty in the market and giving everyone, consumers and insurers alike, a little more peace of mind. Insurers are at work setting their 2018 rates now, with state and federal filing deadlines just weeks away. If Trump and Congress do not take action very soon to permanently fund cost-sharing reduction payments and commit to full enforcement of the mandate, cautious insurers will guard against uncertainty by hiking premiums. In addition to taking these concrete steps, Trump and Republican congressional leadership should also stop rooting for the insurance marketplace to fail. When it comes to premium pricing, even empty words can have real consequences for people’s health care costs. Sam Berger is a Senior Policy Adviser at American Progress. Emily R. Gee is the Health Economist for the Health Policy team at American Progress. * Authors’ note: Among states that reported average 2017 premiums to CMS, the average was $471 per month, or $5,652 annually. For consumers eligible for subsidies, any 2018 premium increase will largely be mitigated by increased premium tax credits, although the uncertainty rate hike would raise costs for unsubsidized enrollees and for taxpayers.